However you prefer to track employee time, we have flexible options to fit your business, including state-of-the-art time and attendance software and time clocks. 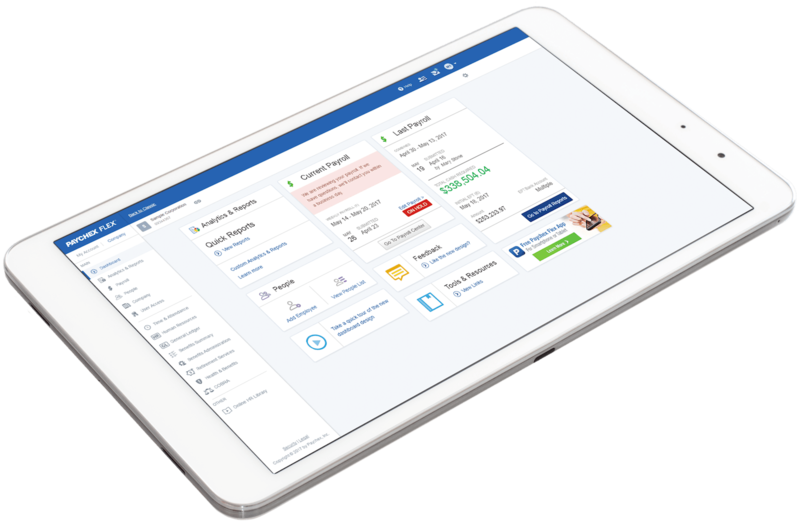 Automate time and attendance processes with Paychex Flex® Time or Paychex Flex Time Essentials, online solutions integrated with payroll and other Paychex Flex services. Reduce time theft, tighten security, and increase efficiency with Paychex TrueShiftTM, our economical and easy-to-use time clock, integrated with Paychex Flex. Fully integrated with Paychex Flex, and quick and easy to use, our InVision® Iris Time Clock with iris recognition technology is more accurate than any other type of biometric time clock. Paychex Flex, our all-in-one HR solution, integrates time and attendance with payroll, HR, and other services — helping you save time and prevent errors from manually importing time sheets. Give your employees the ability to punch in and out on their mobile device with Paychex Time, our easy-to-use app. See how Paychex helped Chicago’s Acceptance Solutions Group (ASG) grow from 30 to 180 employees with support from a dedicated HR professional and solutions that result in annual savings of more than a quarter of a million dollars. Paychex makes HR simple for Vienna Beef, a company with more than 300 union and non-union workers in three states. See how they benefit from the support of our dedicated HR professional and our comprehensive solution.